I get tired of plain starch side dishes…and it’s nice to add flavors that complement a cuisine you are serving. 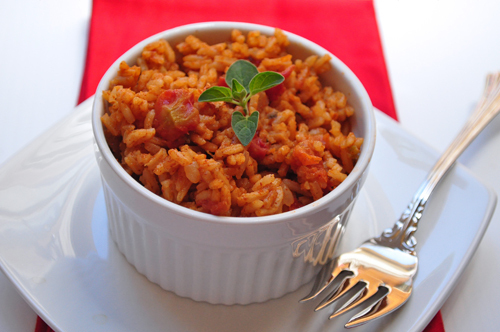 This Spanish (or Mexican) inspired rice is just about as simple as making plain rice, yet much more interesting. Give it a try the next time you are making fajitas or anything else with similar flavors. Heat oil in a large skillet over medium high heat and add onion; cook until barely soft, then stir in rice and cook for 3 minutes. Drain tomatoes, reserving liquid. 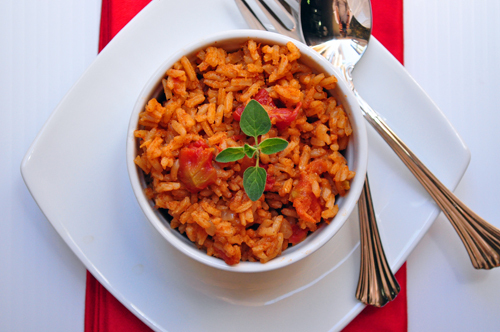 Add water to the tomato liquid until it equals 4 cups, then add to the rice along with the drained tomatoes and spices. Stir everything to combine, then cover, bring to a boil, reduce to simmer, and cook until liquid evaporates, about 15-20 minutes. Fluff before serving and salt and pepper to taste. Thanksgiving is Coming – Top Five Tips! We always buy the Spanish Riceroni packets for dinner, but this sounds so much better- I can’t wait to try this!